We are loving our new space right up the street, and look forward to continuing to bring even more materials and supplies to the community, and continuing to make creativity accessible for everyone! Join us for a 10-hour training for individuals, artists, educators, community leaders, non-profit professionals, and anyone interested in exploring the role of creative arts programming in personal growth and community-building. We start the training with a personal mission statement process that helps us stay focused on the "why?" behind our work. Then, we move through program planning best practices, curriculum writing, and peer feedback opportunities while building community connections between participants. We also offer explorations of art-making & character development, asset-based relationships, and various creative reuse program ideas. If you would like to donate an item you do not see on this list, just ask us! Thank you for your support! 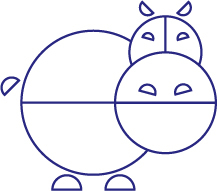 Indigo Hippo exists because of the generosity of our community and the Haile Foundation.